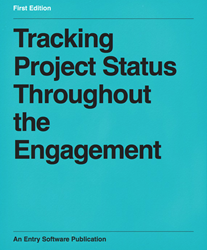 Summary: Tracking Project Status Throughout the Engagement, the newest e-book from Entry Software and written by Brad Egeland, explains why tracking project status is the most important responsibility of the IT project manager. The book will also improve their management of project risks, scheduling, scope and resources required for a successful completion. Not only will the book improve his or her understanding of the importance of project tracking, but also help to communicate more effectively and thoroughly with his or her project team, customers and stakeholders. John McDonald, IT fitness coach with Entry Software Corporation, announces the release of the company’s newest e-book, Tracking Project Status Throughout the Engagement. A free PDF version is available at the following Web page: http://signup.entry.com/download-project-status-ebook. Brad Egeland is the author of Tracking Project Status Throughout the Engagement. He is a business solution designer and information technology/project management consultant and author with more than 25 years of software development, management and project management experience. Egeland provides IT project managers with critical insights about the benefits and value of carefully tracking projects’ status, schedule and scope as well as identifying, avoiding and mitigating risks and utilizing project resources effectively and efficiently. The contents of Entry Software’s new e-book are presented in four easy-to-scan chapters, so IT project managers can refer to it quickly and often throughout the management process. Tracking the Project – Improving the IT project manager’s response and actions when a project deviates from its plan and schedule. Tracking the Project Schedule – Learning how to use this collaborative tool to maintain a project timeline and deliver on time and on budget. Tracking the Project Scope – Delivering a quality product that satisfies the customer’s acceptance criteria. Tracking the Project Resources – Monitoring staffing and financial resources and applying them accurately to the needs of the project. The TeamHeadquarters app (current version 7.0) from Entry Software helps IT project managers implement the ideas in Tracking Project Status Throughout the Engagement. Managers have a greater array of tools to manage projects, customers and stakeholders know the best practices for project management are being utilized on their projects, and the IT project manager’s company is maximizing its brand awareness in the marketplace and retaining more customers. In addition to his accomplishments in IT development, resource and project management, Brad Egeland has also authored more than 2,000 expert advice and strategy articles on project management, small business and information technology for his Website as well as other sites and printed material for software and service clients in many countries and markets. Brad is highly regarded as one of the most prolific go-to authors on project management general topics, advice and strategy in the world. Entry Software Corporation is a leader in providing effective work management solutions to various industries around the globe. Its product, TeamHeadquarters, is a fully integrated palette of unique solutions for IT, Product and Service departments. TeamHeadquarters creates value through cost reduction, improved operating efficiency and enhanced customer communications. To learn more about Entry Software and its products and to access other e-books, case studies and other materials, visit http://www.entry.com/.